Wild blueberries and chia seeds make this pudding a healthy breakfast dish. This wild blueberry pudding is loaded with superfoods. 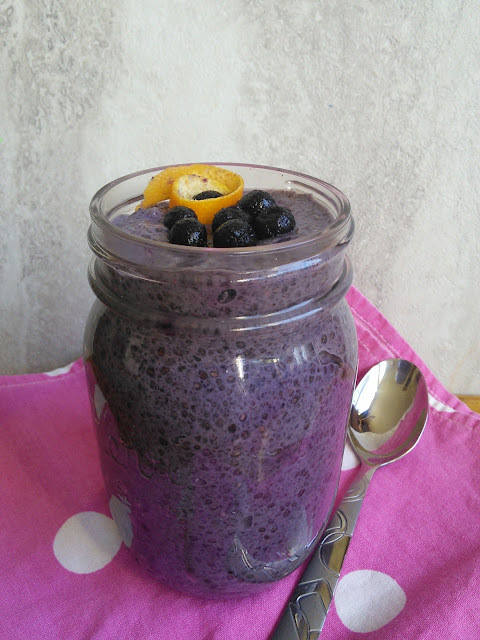 The blueberries are loaded with lots of antioxidants and the chia seeds are rich in omega-3s and fiber. The taste is so delicious that you can serve it as a dessert or for breakfast. I love making this pudding the night before so breakfast is ready when I wake up. Pour the almond milk into a pint-size container that has a lid. Add the wild blueberries, honey and chia seeds. Place the lid on the container and shake well. Place in the refrigerator for at least 4 hours or overnight, shaking occasionally to keep the chia seeds well distributed. The chia seeds will absorb the liquid and swell, giving the mixture a tapioca-like consistency. Pour into serving dishes and add some additional wild blueberries on top of the pudding. Enjoy!